Otto Boerman Ph.D. is professor in Radiochemistry at the Radboud University Nijmegen, The Netherlands. 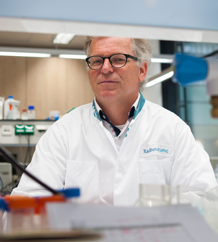 His preclinical research focuses on radionuclide imaging and radionuclide therapy with radiolabelled peptides (RGD, CCK2R, GLP-1R, GRPR, a.o.) and antibodies (anti-CAIX, anti-CEA, a.o.). Otto is on the board of several international journals (including JNM and EJNMMI). He (co-) authored more than 420 scientific publications and is recipient of several prestigious international awards for innovating radiochemistry. Can you explain what the research focus is of your group in Nijmegen? “The main focus of my research group is the synthesis, optimization and characterization of new radiotracers for molecular imaging and radionuclide therapy of cancer. In our research we use high-end molecular imaging equipment to image and quantify in vivo behavior of the tracer in relevant animal models. How do you use molecular imaging tools in your PD-L1 research? “Molecular imaging with microSPECT/CT is of inevitable value in our studies. In this project we used an 111In-labelled anti-PD-L1 monoclonal antibody. We first determined the optimal imaging time point for imaging PD-L1 expression in mice by imaging mice with s.c. MD-MB-231 xenografts longitudinally during 7 days (Fig. 1). To evaluate the potential of this tracer to quantitatively determine PD-L1 expression in tumors we acquired microSPECT/CT scans of mice with human breast cancer xenografts with various levels of PD-L1 expression. 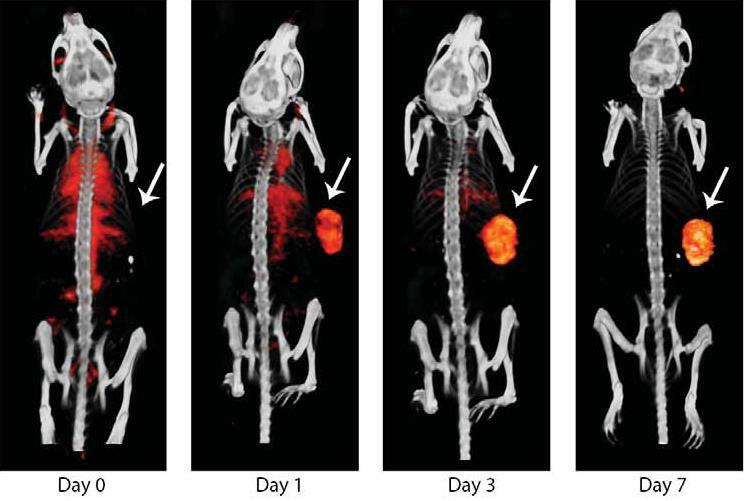 With the U-SPECT/CT system we determined the tumour uptake in these mice (see Fig. 2)”. What is the added value U-SPECT/CT for your research ? MILabs products are used in more than 65 countries and are supported by a global network of distributors and factory trained support engineers outside Europe and North America. Please contact MILabs directly for more information about your local MILabs business partner.